We need your help! We need CE’s material translated and contextualized into more languages. Christian Endeavor unleashes youth to impact their world for Christ. Through training youth workers to mentor young people, churches begin to see new generations grow as servants and leaders. God works through CE to turn quiet and timid youth into Kingdom-builders who can influence the planet! Holy Spirit power works through CE to shape energetic youth to live with purpose for God’s glory. A significant step toward growing this ministry is your financial support toward translating these materials. Existing to Inspire, Equip, and Encourage churches in over thirty countries, CE can make even more of a difference. Your support can allow more disciples to be built. Thank you for partnering with Christian Endeavor! Help spread the word! This campaign ends January 2! December 19, 2016, 15:43 h by Anna Visky. WCEU Newsletter 2016/4 is out!! The full-length interview with former GS Andreas A. Rudolph and present GS David Coryell can be read HERE. December 07, 2016, 09:50 h by Anna Visky. 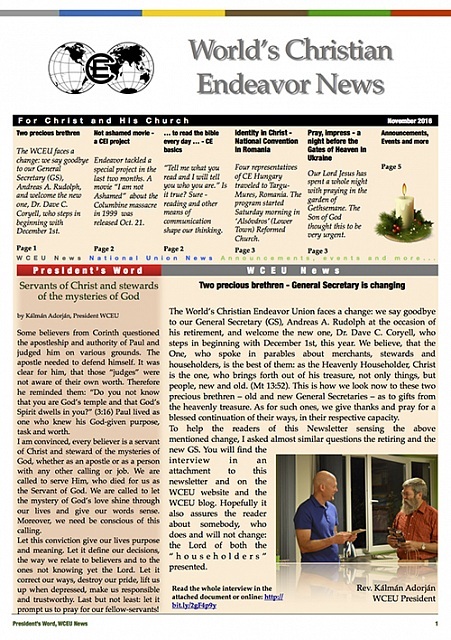 The World’s Christian Endeavor Union faces a change: we say goodbye to our General Secretary (GS), Andreas A. Rudolph at the occasion of his retirement, and welcome the new one, Dr. Dave C. Coryell, who steps in beginning with December 1st, this year. We believe, that the One, who spoke in parables about merchants, stewards and householders, is the best of them: as the Heavenly Householder, Christ is the one, who brings forth out of his treasure, not only things, but people, new and old. (Mt 13:52). This is how we look now to these two precious brethren – old and new General Secretaries – as to gifts from the heavenly treasure. As for such ones, we give thanks and pray for a blessed continuation of their ways, in their respective capacity. To help the readers of this Newsletter sensing the above mentioned change, I asked almost similar questions the retiring and the new GS. You will find the interview in an attachment to this newsletter and on the WCEU website and the WCEU blog. Hopefully it also assures the reader about somebody, who does and will not change: the Lord of both the “householders” presented! You look back now to one decade of service in WCEU. As far as I can trace it back, you never wrote about yourself in the “Who is…?” (brief information about the officers and trustees of the WCEU) column of the WCEU Newsletter. Of course, the whole Newsletter, which you edited and your reports tell a lot about you, still, I would like to ask you to introduce yourself in a more personal way. How did your life resp. your life with Christ begin? In November 1951 I was born into a factory-workers family. My father did upholstery and lining in railway cars, my mother ran the family, with finally three boys and a girl. She also worked in the fields, garden and farm and produced most of the food for the family. I was baptized as an infant and that was the beginning of my life with Christ. Later I grew in understanding and trusting Christ. When did you meet first CE? How did it mold your relationship with God and with fellow believers? A girl of the local CE was my Sunday School teacher and at the age of 10 I joined the Junior CE group. The CE members were our closest friends and they spend a lot of time with my brothers and me. I became a co-leader of the juniors and then first an 'associate'; later an 'active' member of CE. In the course of these years my faith was formed as it is taught and understood in the pietistic fellowship movement, of which CE in Germany is part of. What blessings and testings did you encounter personally or as a couple? Our marriage is a great blessing and I am very grateful for Hanna. 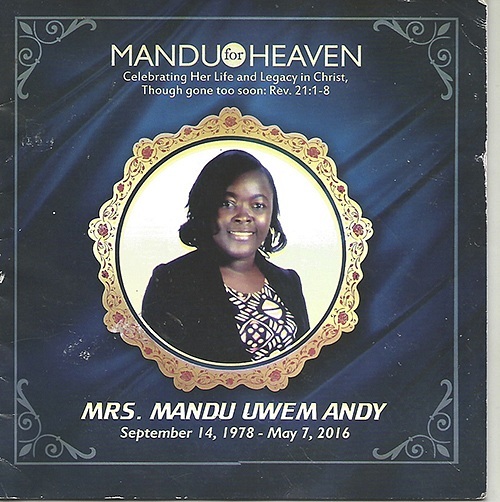 I learned a lot from her, especially how her nasty health issues after all led her to a closer walk with Jesus. Having no children – although we both have been assured by the physicians to be perfectly o.k. - is a challenge and the saddening mildew in our life. However, I decided to get excited, whenever friends had a baby, and to support them and their children. And – the Lord made me to care for thousands of children in India while I was responsible for the Social-Missionary Service of the German CE. Hanna and I consider it a great blessing too, that we had the chance to live in different cultures and meet sisters and brothers from all parts of the world. 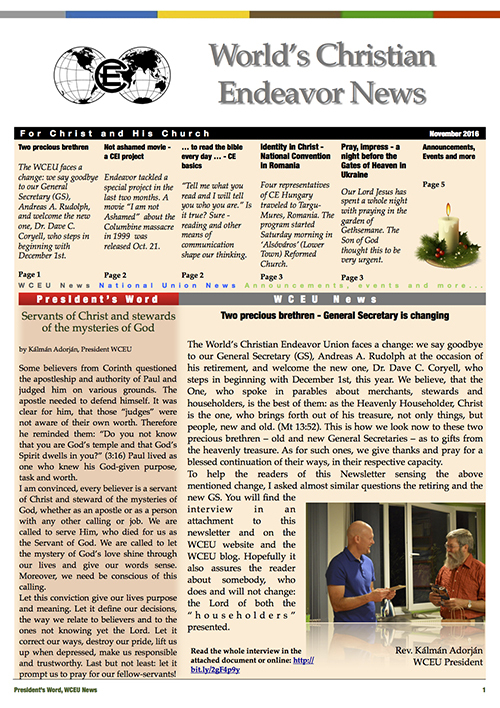 Which aspect of CE meant the most for you personally and in the ministry? Unity and fellowship despite all the diversity of cultures and denominations; the learning by doing aspect, which successfully trains children and youth to serve Christ and the church. What made you decide to enter Christian ministry? In which forms of it have you been involved so far? I am a trained gardener and completed 3 years of studies in this field with the degree 'Engineer of Horticulture' at the age of 21. While attending a CE camp – I was 20 years old – the Lord spoke to me through the bible study lessons on the prophet Jonah with the theme „A fellow-worker runs away from God”. I was quite disturbed since I did not expect a call into the full-time ministry. But once I promised Jesus to go for theological studies, trusting he will provide my needs, peace returned into my heart and I knew this is what he wanted me to do. After my training I was pastor of State Church Fellowships in Hannover. Then (1979) Hanna and I got married and left Germany to work in an Armenian village in Lebanon (development assistance). From 1983 to 1990 I was again pastor of a Fellowship in and around Fulda and joined 1990 the German Youth Federation for Christian Endeavor. I was responsible for the German CE sponsored projects in India and a few other places. 2000 through 2002 I was director of a mission supporting Armenians in Lebanon and Armenia. 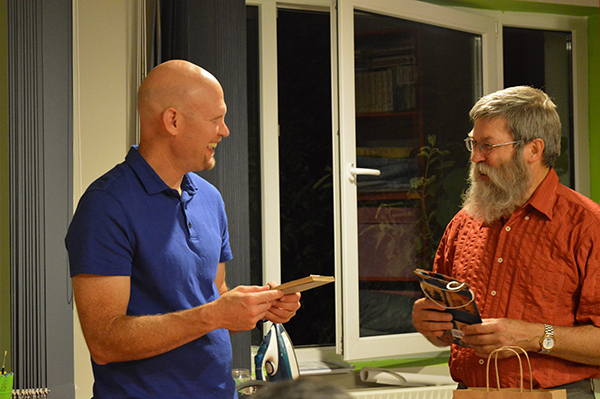 After a sabbatical in 2003 I was again pastor in a State Church Fellowship, in Cottbus near Berlin. How did you become GS of WCEU? What were your priorities? Having been WCEU Trustee since 1994, WCEU President F. Lavata'i and Treasurer J. Stewart approached me during the World's CE Convention in Gödöllő, Hungary, offering that position. I accepted hardly knowing anything about the job. In the beginning I tried to find out, what I should do and I realized soon that it is most important to know the endeavorers in the world. So I tried to attend national events and to establish personal contacts. This was helpful for finding able people from all parts of the world who would serve WCEU in various ways. WCEU became more international and more endeavorers shouldered the tasks to be done. During these ten years you traveled a lot, met many kind of people within CE worldwide. What good experiences did you gather? I learned that CE thrives, where leaders wholeheartedly invest themselves in the work. It pays off to allow the youth to run their CE. God provided them with so much creativity, power and dedication, that it is almost a sin to block these gifts. I found that many well-functioning youth organizations practice the CE principles of F. C. Clark at least partly. Which were the greatest challenges/difficulties for you? The beginning in the US, with nobody around to ask and not knowing whether there will be enough funds to run WCEU. It was sobering as well to experience that many National CE Unions are not well connected with each other and with the WCEU and have little interest only in expanding CE outside their country. Also, the national unions expect financial support from the WCEU but hardly anyone is ready to give to the WCEU. Just for the sake of fun: Hired, tired and retired? Thank God, it is not the case of “fired”! How do you leave this service? Believe it or not, I leave my ministry with the WCEU “Hired, tired; fired and retired!”. The pension scheme pays in my case from May 2017 only. So the German CE had to dismiss me (Nov.30th); which obliges the unemployment insurance to pay until then monthly about half of my present salary. Through a couple of tasks I'll be taking care of also after the end of my contract, I will stay connected with the WCEU. How shall we continue to pray for you? November 29, 2016, 14:33 h by Kálmán Adorján, WCEU President. 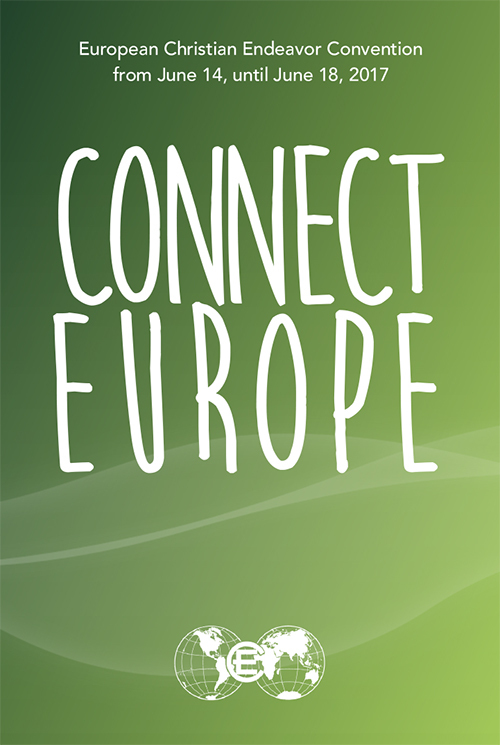 The J-Camp Team finished the flyer for ConnECt Europe 2017. 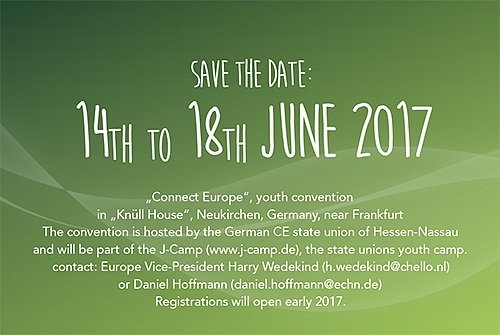 Our regional (European) conference will be held in Neukirchen/Knüll, Germany, in between Frankfurt, Kassel and Marburg. Our special guest is the new World’s Christian Endeavour General Secretary, Dave Coryell, who wants to meet as many European CE leaders and endeavourers as possible. So, don’t hesitate to come and join us! Registration opens early 2017! Please send this flyer to your societies and other endeavourers in your country. November 16, 2016, 13:51 h by Anna Visky.